The artist is the subject of several rumours, including that she might be a robot, a member of the Illuminati, or a pawn subjected to mind control. This is Poppy. A 22-year-old YouTube prima donna and pop princess, Poppy currently occupies one of the weirdest corners of the web – and, in her two-year existence online, she has already inspired her own religion. Her YouTube channel, “Poppy,” is a hallucinatory digital wormhole with hundreds of videos, many of which have garnered millions of views. And it seems that Poppy’s hold on pop culture has only just begun. 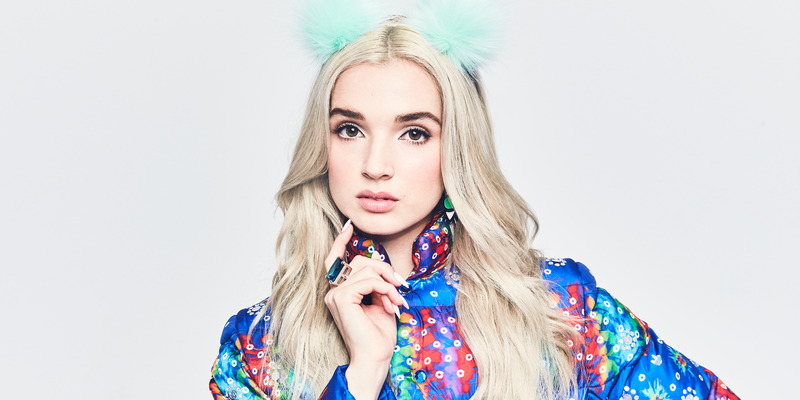 This year, Poppy released her first studio album, embarked on a nationwide tour, was featured in a Sanrio ad campaign, and teamed up with Comedy Central for a Snapchat show. Poppy’s personality is a cross between a chatbot and a child. If you ask Poppy a question, she’s sure to answer with demure, algorithmic precision. Where is she from? The internet. What does she like to do for fun? Listen to “the sound of rain falling” in “videos on YouTube.com.” How old is she? She doesn’t identify with age. “Age is just too2016,” she says. But Poppy’s pre-packaged persona isn’t entirely of her own making. The character known as “Poppy” can largely be attributed to Titanic Sinclair, Poppy’s director, whose bleached platinum hair makes him look as though he could be Poppy’s older sibling. According to Sinclair, he met Poppy at a party in Hollywood two years earlier. According to both Poppy and Sinclair, there is no Poppy that exists prior to the internet version of Poppy. Like the Poppy video in which she repeats the words “I’m Poppy” for 10 minutes straight, we’re reminded that Poppy is Poppy is Poppy: She exists in a continuously self-justifying loop, a character unfettered by the constructs of time and boundaries of logic. Of course, in the internet age, it’s not difficult to find the identities of Poppy and Sinclair online. A quick search reveals that Poppy and Sinclair’s real names are Moriah Pereira and Corey Mixter, respectively. She’s from Nashville and he’s from Michigan, and they have a shared interest in video-making and pop music. But attempting to piece together the historical realities of the people, or characters, now known as Sinclair and Poppy, isn’t really all that fun, nor is it very interesting. It’s more fun, for instance, to be in on the illusion, or at the very least, to suspend disbelief and believe along with the rest of the internet, that Poppy might be the first real iteration of a flesh-and-blood AI manifestation. Rumours swirl among Poppy’s fans. Is Poppy real? Is she a pawn subjected to mind control? Is she a member of the Illuminati? Is she even human? On the surface, Poppy and Sinclair have done their best to quash these stories. In their videos, they have both openly stated that Poppy isn’t involved in a cult and even gone to such impish measures as to emblazon the message “I am not in a cult led by Poppy,” on a T-shirt, available for purchase on Poppy’s website. Poppy’s intrigue is only heightened by the conspiracy theories, which orbit her persona like satellites. These rumours, in part, are one of the key reasons Poppy is entirely unique, and why she’s so successful. In an age of immediate internet access, Poppy has achieved the impossible: She’s managed to maintain an aura of mystery. As more and more pop stars provide their fans with intimate access to their personal lives through documentaries and social media, Poppy is a refreshing counterpoint. Poppy won’t everdish up the drama of her love life. Poppy doesn’t want you to wonder about her past, and she certainly isn’t going to tell you about the turmoils of being an artist. She’s an otherworldly, semi-Warholian product, and she’s here to entertain you. “People are going to dig into whatever they want to,” says Titanic, but this line of rhetoric “isn’t interesting.” He likens people who attempt to pin down Poppy’s real identity to an audience attempting to deconstruct the method in a magic trick. “The world is a lot more exciting when you don’t have the curtain pulled to reveal all of the wires,” says Sinclair. “It’s always a huge let down when a magic trick is revealed and you realise it’s just sleight of hand or some sort of simple illusion.” If you pull aside the curtain, and attempt to crack Poppy’s hyper-curated persona, in the end, the only person you’ve cheated is yourself.